The Flash reveals the true extent of DeVoe’s plan as the team continues to hold themselves together after a string of defeats. Villain plans are difficult things to come up with. They need to be clever enough to keep the heroes from thwarting it as well as threatening enough to establish very real stakes. Not to mention the fact that it needs to feel unique to the villain as a character and make sense within the context of what has been built up so far. DeVoe’s plan is none of those things. For one thing the show has spent no time exploring his motivations so the flashbacks in this episode that outline them come from absolutely nowhere. He might as well be a character who was introduced in this episode for all the good it has done to have him around all season. After keeping viewers in the dark about what DeVoe’s endgame is the reveal is woefully underwhelming. His hatred for technology and desire to revert the brains of every Human being on Earth to a simpler state is laughable. All his talk about technology being a blight on Humanity and that any achievement that can be used to hurt people definitely will be is incredibly arrogant. Marlize’ point about people being the problem rather than technology itself is an effective counter but DeVoe is so committed to his belief that he openly dismisses her. 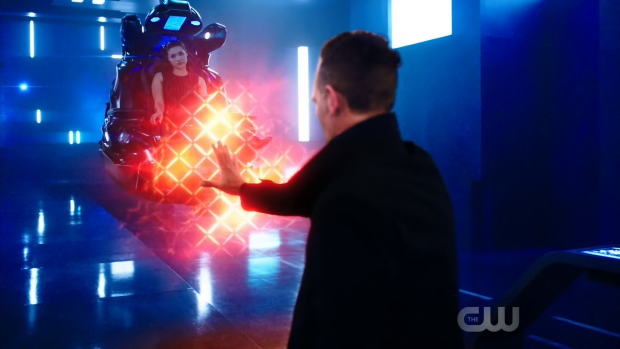 A large part of the problem is that DeVoe’s opinion makes no real sense since the writers have made no effort to justify it other than through the use of pseudo-intellectual nonsense designed to essentially bully Marlize into accepting that she’s wrong rather than holding a valid opinion of her own. Amusingly he is also a complete hypocrite because pretty much everything he has done this season has been with the aid of technology of some kind. His chair is a piece of technology, the pocket dimension he hides in is accessed using technology, he instantaneously transports from place to place through the use of technology and he wouldn’t have his intelligence nor would he have been able to harvest all of the Metahuman abilities he has without the use of technology. It also begs the question why he bothered to harvest those powers. The implication was that he needed those specific powers in order to carry out whatever his plan is but that apparently isn’t the case as he simply uses them to steal more technology from various locations. If that was what the abilities were needed for then that’s a really poor justification as someone with boundless intellect could easily stage a heist. I really hope there’s more to the acquisition of specific abilities because none of this is adding up to anything good at this point. Part of the point of the flashbacks is to establish that DeVoe is really far beyond redemption at this point. Flashback DeVoe is compassionate and somewhat empathetic even if his way of showing that comes across as profoundly arrogant. He seems to be secure in his belief that technology is overall a bad thing for Humanity and makes specific arguments against the lengthening of life spans because it puts Earth’s resources under further strain. These ideas are misguided but make a degree of sense as long as certain other factors are completely ignored. In the present day, DeVoe has ceased to be compassionate in any way because his intellect has expanded to the point where he no longer sees himself as Human so doesn’t consider other people to be something worth caring about. Last week established that he no longer understands emotion because his intellect can’t process it as being a factor that influences action. There’s a certain irony in DeVoe’s lack of compassion because he has become comfortable in harming people even though part of his underlying motivation is supposed to be founded on the idea that people will inevitably come to harm by any advancement with that potential. His use of technology to further his cause even though he apparently despises it also contains a certain irony that in theory shows how divorced DeVoe is from the man he once was. This could be interesting if enough work was put in to make it interesting but the character at this point is a mess of contradictions that don’t head anywhere interesting. What does a world look like where everyone has been lobotomised to the point of low intelligence and what benefit does that bring exactly? As the episodes go on we’re moving further and further away from the genius that Team Flash are no intellectual or physical match for. Marlize continues to be an interesting character who is organically being developed independently of her husband. The flashbacks show the beginnings of their relationship and her discomfort with his beliefs. 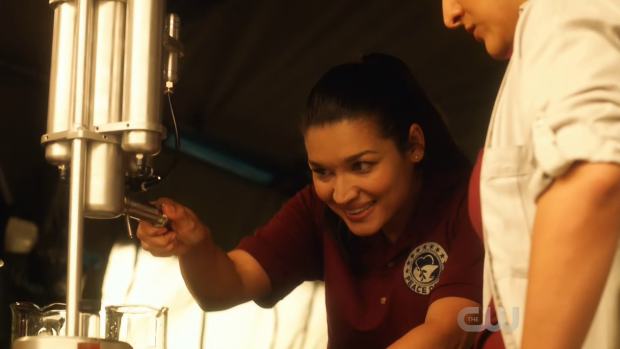 Her reaction to finding his insane manifesto is really well played by Kim Engelbrecht and having this split them apart makes complete sense. Marlize has seen the truth of the man she loves and it terrifies her to the point of getting as far away from him as she can. It helps establish Marlize as someone who can be redeemed because compassion is one of the pillars of her character. That much is evident in what has been done with her so far this season and the present day portion of the episode constantly has her be the voice of reason when her husband devalues Human life so casually. The incident that brings her around to his way of thinking in the flashbacks doesn’t feel like enough to change her mind so completely. Turning her entire belief system on its head because militia kill lots of people to get hold of a water purification device doesn’t work because it basically proves her point that technology can’t be blamed for what people choose to use it for. To accept her change of heart is to believe that the water purification device is someone at fault for killing innocent people. It’s a fact that people chose to do that because they heard about the device but their actions weren’t the fault of the device itself. It’s ludicrous to think otherwise and to have that be the entire justification for Marlize deciding that DeVoe’s cause was one worth working towards is really weak. Her decision to leave her husband makes a lot more sense because it feels earned in terms of the plot and for her as a character. This episode establishes her as someone growing increasingly more uncomfortable with the actions of her husband while repeatedly watching him either kill or threaten to kill people who don’t need to be harmed in order to accomplish their goals. Eventually she can’t take any more and decides to leave him because she doesn’t want to be a part of it any more. She puts her point across poetically by telling DeVoe that her husband no longer exists and was “The Thinker’s first victim”. She recognises nothing about the man that used to be her husband and removes herself from the situation. 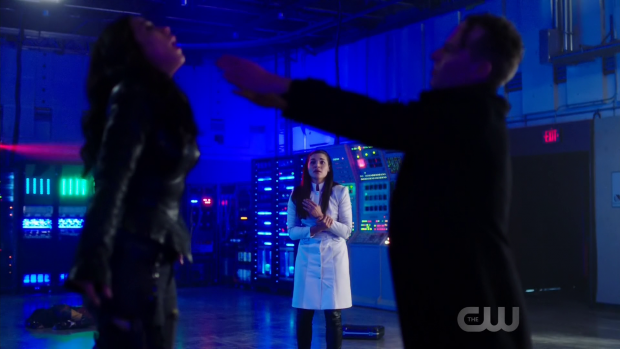 Surprisingly the episode doesn’t do anything with the abusive nature of their relationship previously shown through DeVoe drugging her in order to make her compliant. Marlize using that as part of her justification for leaving him would have made the split more powerful because it would have been an example of a woman escaping her abuser and regaining some of her own agency in the process. Now that she has left DeVoe there is a lot of potential for her character to develop. The most boring choice would be joining Team Flash and I’m not convinced that her goals align with theirs enough to make for an effective alliance. 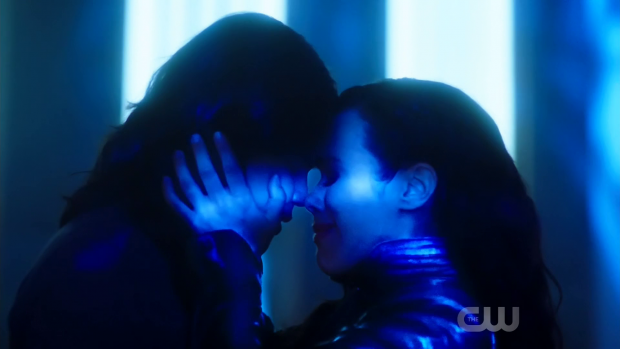 It is mentioned that DeVoe is basically nothing without him but there’s a real opportunity to show what Marlize is without him. I wouldn’t be surprised if she emerges as the true villain of the season which would definitely save us from more DeVoe related stupidity. There’s not an awful lot else to recommend about this episode. If you like the Cisco/Gypsy relationship then there’s a good chance that this episode will upset you because it spells the end of that romantic pairing. The thread of Cisco’s job offer to be the replacement Breacher is picked up by showing that he has been struggling to come to a decision. Initially it appears that Cisco’s difficulty has to do with being torn between his loyalty to Team Flash and his desire to work side by side with the woman he loves but further probing reveals that the job isn’t something he wants but he doesn’t know how to break that news to Gypsy. He has fallen so deeply in love with her that he wants to see her every day and hates the fact that he can’t. Working with her would solve that problem but it doesn’t alter the fact that being the next Breacher isn’t something he’s interested in. This puts the relationship at an impasse because Gypsy considers the mechanics of their current relationship to be enough considering how focused she is on her career. Cisco doesn’t feel the same because he wants much more than that but would never stand in the way of her commitment to her work. This means that the only solution is for them to go their separate ways and get on with their lives which is both mature and reasonable. I would go so far to say that I don’t mind this as a conclusion because their problem is a very relatable one if you consider that their relationship is very much a long distance one. It may have the trappings of superheroes and interdimensional travel but at its core its the story of a couple who live really far away from one another and don’t see each other very often. It works for a while but eventually takes a toll once the relationship becomes serious meaning that the end result is an amicable split. It’s also probably the best thing to do with a relationship that the writers haven’t actually given much focus to of late. Cecille returns in this episode after an extended absence to support Harry as he continues to lose his intelligence. 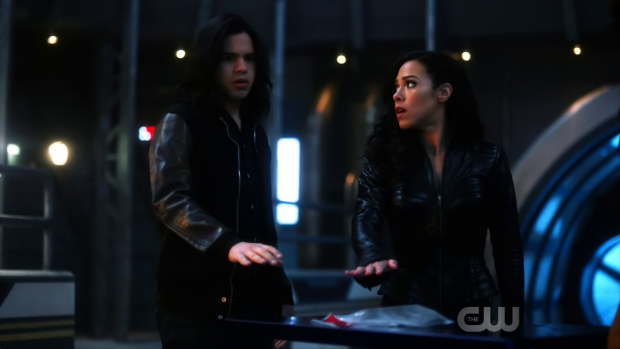 Her mind reading ability allows her to read his thoughts before he forgets them so she is able to translate what he’s thinking into words that Team Flash can make sense of. It’s not a bad dynamic and it’s always a pleasure to see Tom Cavanagh work with Danielle Nicolet as they make for an engagingly watchable comic duo with a fun connection. Caitlin’s efforts to reawaken Killer Frost by frightening her into producing enough adrenalin to bring her back offers little more than a brief diversion. I can see that the intention is to further the notion that she feels like a part of her is missing and she wants it back. That’s fair enough but the execution is less than inspiring. Triggering the fear response might be a solid idea but the methods are questionable. If all they need to do is get her scared enough to produce the adrenalin response then why doesn’t she go bungee jumping, ride a roller-coaster, go skydiving or partake in any other activity designed to do what they are attempting? The writers of this show often fail to consider very basic solutions to problems and it really hurts the storytelling. The mystery girl makes another return in this episode. It’s another instance of reminding the audience that she exists rather than giving us much in the way of story. Once again there are hints that she’s from the future when she specifically guesses that Cecille’s baby will be born in exactly 21 days with the added information that she’s a Speedster with purple in her lightning which furthers the theory that she’s a descendent of Barry and Iris. I can’t help but wonder if her appearances are actually leading to something or if they are random asides that have nothing to do with the overall story. A hilariously bad episode that finally reveals DeVoe’s plan as something that is so far beyond stupid. His hatred of technology comes from nowhere and his plan to lobotomise the Human race in order to protect them using technology makes absolutely no sense. The motivation for this mindset is introduced in this episode rendering DeVoe’s prior appearances completely pointless as they don’t build up to this point. His acquisition of specific powers seems to be in service of successfully stealing the component parts that he needs so there was no real purpose behind that either. The real strength comes from Marlize who makes the decision to leave him in a way that works for her character. Flashbacks don’t do a very good job of justifying why she came around to his way of thinking but her compassionate side being the root of her decision works really well. It would have been better if the abusive side of the relationship had come into play but the opportunity to take Marlize in more interesting directions has me intrigued. Cisco breaking up with Gypsy works well enough considering so little effort has gone into the relationship. Setting it up as a conflict between his loyalty to Team Flash and his desire to see more of his girlfriend before revealing that he didn’t want to take Breacher’s place in the first place was a nice touch. Having their break-up boil down to being a long distance relationship where they have different priorities works well enough and is probably the best that could be done with something the writers paid so little attention to. 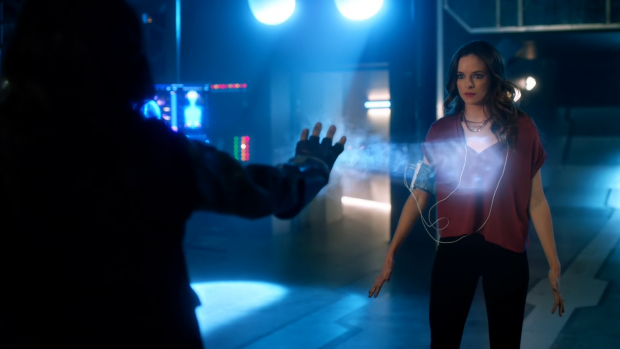 Caitlin’s desire to bring back Killer Frost does little more than fill time despite the attempt to focus on her missing an important part of herself. There were better and more fun ways to have her attempt to trigger an adrenalin based fear response that the episode doesn’t even mention. Cecille and Harry make for an engaging pair as always and the use of her mind reading ability to read his thoughts before he has the chance to forget them is a really nice touch. The mystery girl appearance is another example of reminding us that she exists by further hinting that she’s from the future though she is revealed to be a Speedster with the same lightning colour that Iris had heavily suggesting she’s a descendent of Barry and Iris. I’m left wondering if she will factor into the endgame of the season in any meaningful away or if her appearance is a pointless aside.